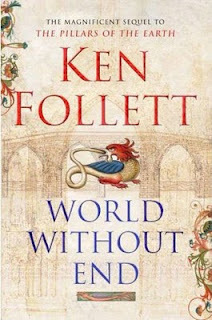 World Without End is the magnificent sequel to the very popular Pillars of the Earth, an historical epic I thoroughly enjoyed reading about 15 years ago. This is a stand alone book but I imagine the length of > 1100 pages will deter a lot of would be readers. All I can say is don't be frightened by the size! When I was turning the last page I still didn't want it to end!! Set in England in the 1300's this historical epic follows the lives of several main characters from childhood to late adulthood in the town of Kingsbridge and surrounds. This book covers all social classes from mere serfs, to merchants, monks, nuns, nobleman, squires, knights, Kings and Queens. Their lives intertwine and the novel takes the reader on a mammoth journey of love, war, hate, faith, jealousy, revenge, lust, passion, injustice, struggle and starvation, accusations of witchcraft, bribery, deception, greed, fear, enterprise and healing. I was also fascinated when the country was struck by the plague and the differing impacts it had on the main characters and residents of Kingsbridge. The Kingsbridge Cathedral is the main backdrop for the book and the stunning architecture and descriptions detailing how it and other structures in Kingsbridge were built allow the reader to feel the history and I could really imagine myself there. I was completely hooked on the first page, and could have stayed in Kingsbridge for another 100 years. I recommend this book to everyone as a 'must read' for 2009 and am in awe of the author Ken Follett. This is an absolute masterpiece. Thanks very much, I'm glad to hear it! Bless you for the fantastіϲ outlook on this issue. I wish you the best of luck witth your upcoming work!